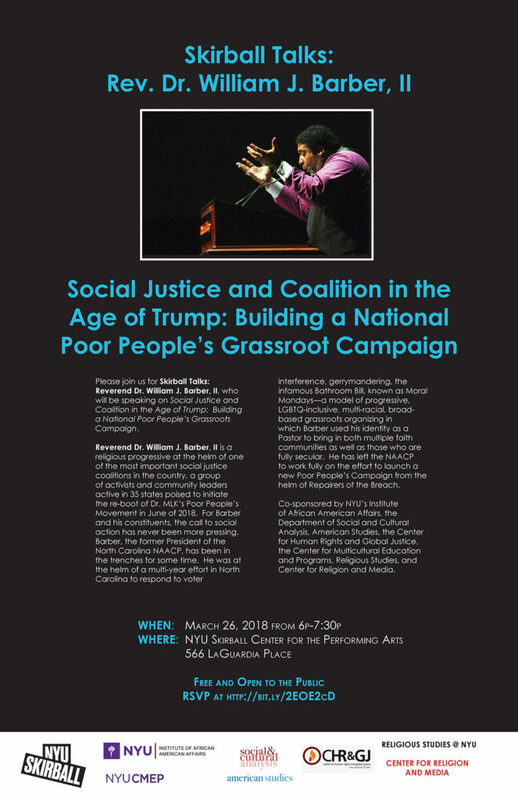 Please join us for Skirball Talks: Reverend William Barber, who will be speaking on Social Justice and Coalition in the Age of Trump: Building a National Poor People’s Grassroots Campaign. Reverend William Barber is a religious progressive at the helm of one of the most important social justice coalitions in the country, a group of activists and community leaders active in 35 states poised to initiate the re-boot of Dr. MLK’s Poor People’s Movement in June of 2018. For Barber and his constituents, the call to social action has never been more pressing. Barber, the former President of the North Carolina NAACP, has been in the trenches for some time. He was at the helm of a multi-year effort in North Carolina to respond to voter interference, gerrymandering, the infamous Bathroom Bill, known as Moral Mondays—a model of progressive, LGBTQ-inclusive, multi-racial, broad-based grassroots organizing in which Barber used his identity as a Pastor to bring in both multiple faith communities as well as those who are fully secular. He has left the NAACP to work fully on the effort to launch a new Poor People’s Campaign from the helm of Repairers of the Breach. RSVPs to this event will become available starting Monday, March 5, 2018. Barber is a powerhouse of a public speaker. You can see his address to the DNC in the summer of 2016 here. And an interview regarding his work on PBS NewsHour here. Professor Nikhil Singh (NYU) will introduce the talk. Presented as part of the new SKIRBALL TALKS series. Mondays at 6:30 during the academic terms, SKIRBALL TALKS hosts visionaries from the worlds of politics, the arts, sciences, academia, and more. Rev. Dr. William J. Barber, II, president of the North Carolina NAACP from 2006 to 2017 and current member of the NAACP National Board of Directors, leads an alliance of more than 200 progressive organizations known as “Moral Monday.” This coalition has led justice work in North Carolina for a decade and inspired organizing across the nation. Rev. Dr. Barber delivered “the most engaging” of a stellar set of speeche at the 2016 Democratic National Convention, the Washington Post observed. This spring, Rev. Dr. Barber has convened the Poor People’s Campaign, a national coalition to push poverty and its implications for healthcare, education, incarceration, environmental hazards and life-chances generally, particularly for children, back on the nation’s agenda. This crusade marks the 50th anniversary of the original Poor People’s Campaignof 1968, which Dr. King launched but did not live to lead. Moral Monday is a multi-colored coalition that fights for voting rights, public education, universal healthcare, environmental protection, and the rights of women, labor, immigrants and members of the LGBTQ community. In 2013, tens of thousands joined weekly protests at the North Carolina legislature; police arrested more than a thousand in civil disobedience. According to Public Policy Polling, the Moral Monday protests reshaped public opinion and pushed Gov. Patrick McCrory’s polls down from 65 to 34 in four months. He never recovered and became the only incumbent GOP governor who could not ride Trump’s coattails. On February 2, 2014, USA Today reported 80,000 at the Mass Moral March on Raleigh; this annual gathering of the Moral Monday coalition continues to draw tens of thousands each year. Rev. Dr. Barber leads Repairers of the Breach, based in North Carolina but focused on America’s future. For the past two years, he has convened a national organizing tour called “The Revival: Time for a Moral Revolution of Values,” working alongside Rev. Dr. James Forbes, Rev. Dr. Traci Blackmon, Sister Simone Campbell and Rev. Dr. Liz Theoharis to redefine public morality and support state coalitions to address poverty, injustice, and inequality, and to lay the groundwork for the Poor People’s Campaign, which will begin May 13 and run until June 21 on the mall in Washington. Nikhil Pal Singh is Associate Professor of Social and Cultural Analysis and History at New York University, and Faculty Director of the NYU Prison Education Program. A historian of race, empire, and culture in the 20th-century United States, Singh is the author, most recently, of Race and America’s Long War (University of California Press, 2017). He is also the author of Black Is a Country: Race and the Unfinished Struggle for Democracy (Harvard University Press, 2004), and author and editor with Jack O’Dell of Climin’ Jacob’s Ladder; The Black Freedom Movement Writing of Jack O’Dell (University of California Press, 2010). Singh’s writing and historian interviews have appeared in New York Magazine, TIME, the New Republic, The Intercept, NPRs Open Source and Code Switch. Co-sponsored by NYU’s Institute for African American Affairs; the Program in American Studies at SCA; the Center for Human Rights and Global Justice; Religious Studies; and the Center for Religion and Media. NYU Skirball is an accessible venue.